I’ve just been to see a truly wonderful exhibition by Julie Goring at the Meffan Gallery in Forfar. ‘The Familiar World’ is an exquisite collection of paintings and constructed pieces. Both combine the artist’s refined painting style with an illustrator’s eye, and interjections of calligraphic craft. Julie says that her “art heroes are the late mediaeval artists who despite working under commission showed a particularity of vision”. 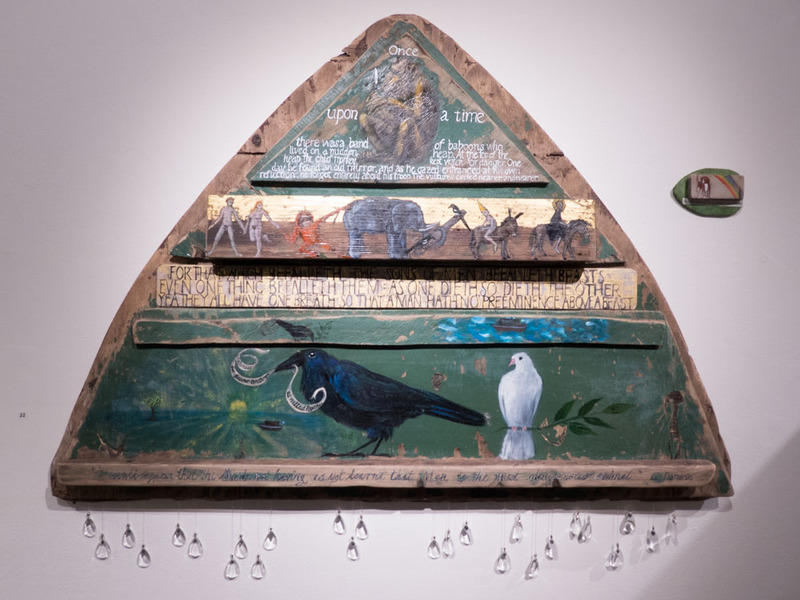 In this show she succeeds in drawing upon this source of inspiration, but brings to triptych, wayside shrine, and icon her own particular sensitivities of narrative, humour, and compassion. I found a great deal to enjoy here – there was so much of the subject matter that appealed to me. Storytelling, flocks of birds – rendered with ornithological accuracy as well as affection – tightness of subject, but looseness in stroke and richness in texture. 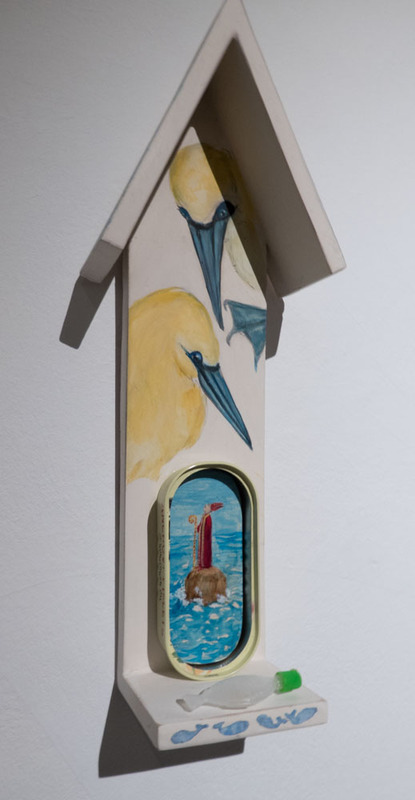 A feature of the show is an unusual range of formats – punctured doors, a fragment of ark, even a box to spend eternity in, and, of course, a quirky but charming series of saintly shrines. The diversity of format doesn’t throw you off kilter, however. The painting is consistently strong. Riffing on the mediaeval, but also echoing Klimt, gold and lettering occur often. The presence of many reworked collected objects combined with the feeling of an undercurrent of soundings from ‘Other Times’ reminded me of Will Maclean, but here the tone is lighter: humour hints hard at hope. I can’t recommend this show enough. If you’re near and you can – go! 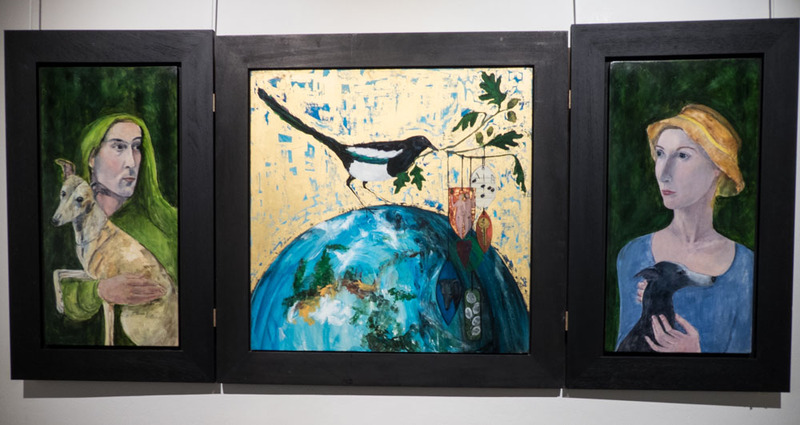 ‘The Familiar World’ by Julie Goring is at the Meffan Gallery in Forfar until 25th April 2015. This entry was posted on Tuesday, April 14th, 2015 at 6:54 pm	and tagged with Goring, The Familiar World and posted in animal, Art, Review. You can follow any responses to this entry through the RSS 2.0 feed.